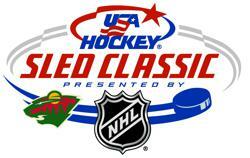 The Minnesota Wild and Minnesota Hockey held the eighth annual USA Hockey Sled Classic, presented by the NHL. The four-day event took place Nov. 16-19, 2017, at the Plymouth Ice Center (3650 Plymouth Blvd, Minneapolis, MN 55446). A record 28 sled hockey teams affiliated with a record 20 NHL teams took part at this year's event. For more information about the event, download the information packet to the right or click here.